Two shattered Molotov Cocktails in a wall mounted display unit made from modified found objects: two small Coke bottles painted in blackboard paint leaving only the letters “o” and ”k” respectively. 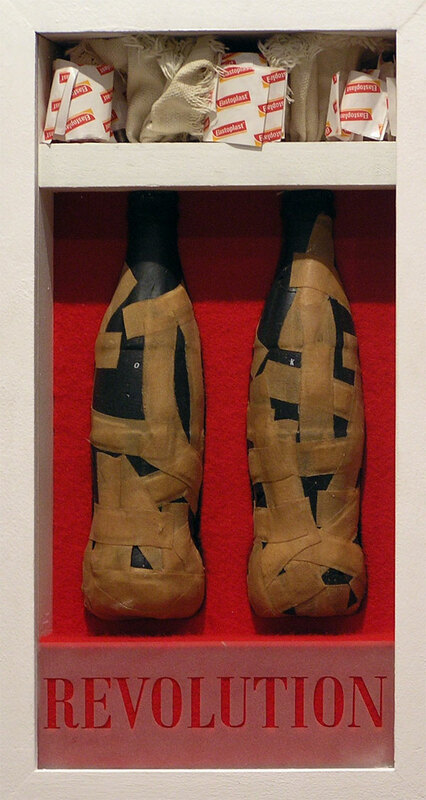 The bottles were modified by throwing and ultimately shattering them against a wall – after which they were carefully re-constructed with everyday ‘Elastoplast’ plasters used as primary adhesive material. The final object was coated in thin layers of wood glue to stabilize & protect the object. All the ‘Elastoplast’ wrappings were kept and placed in separate compartment at the top of the display case with a single 2mm glass plate sealing the object.